A Consolidated B-24D Liberator and a Boeing B-17E Flying Fortress using the looped-hose method of refueling. After the Japanese attack on Pearl Harbor in 1941 the U.S. Army Air Forces began to study methods to extend the range of its bomber aircraft. The Army chose the looped-hose aerial refueling system that had been patented by British Flight Lieutenant Richard Atcherley in September 1934. The American version featured improvements over the original British version such as a carbon dioxide purging system to reduce the risk of fire. Prior to the refueling rendezvous both the receiver and tanker would trail a cable with a grapnel hook. The cables had a 2,000 lb rating which was increased from 1,300 lb rated cable used in the British system due to increased refueling airspeed and resulting airloads. As the receiver flew straight and level, the tanker would fly slightly above, behind, and offset to one side. The tanker would then cross over from one side to the other and the cables would become hooked together. Once the cables were attached the tanker used an electric winch to reel in the bomber’s cable which was then attached to the transfer hose. 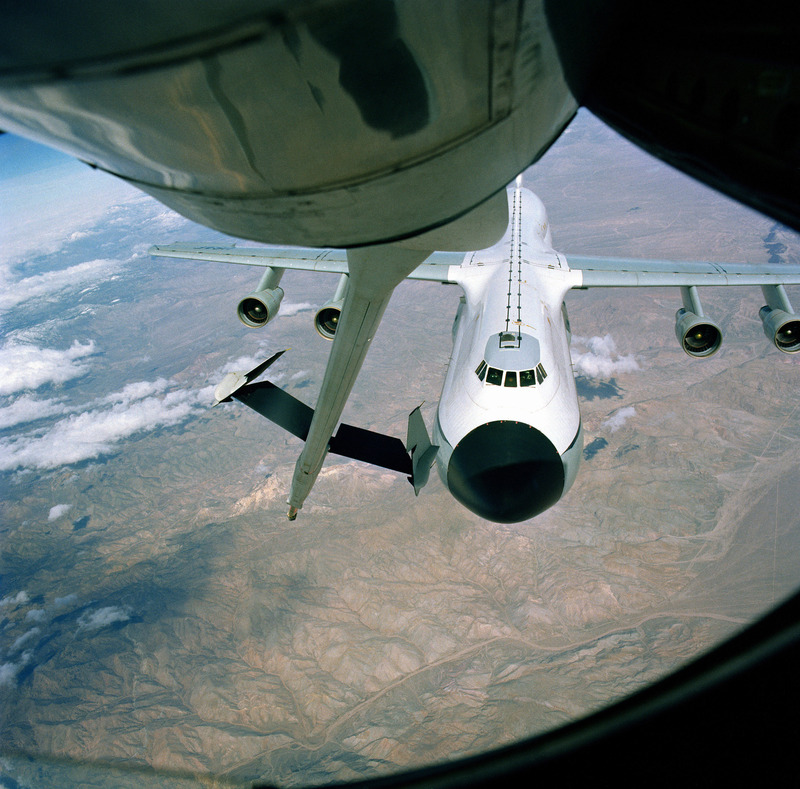 After the hose was attached to the bomber’s cable (and the tanker’s cable detangeled from the bomber’s cable) the bomber used a hydraulically powered winch to pull the 235′ fuel hose to its receptacle. Once the connection was made the tanker would ascend slightly and allow gravity transfer of fuel to begin. Using this system, 1,500 gallons of fuel could be gravity transferred in 18 minutes. The indicated airspeed during the operation was 150 miles per hour. Testing between a Boeing B-17E receiver and a Consolidated B-24D tanker began in the summer of 1943 at Eglin Field, Fla. The successful tests extended the B-17’s range (with three tons of bombs) from 1,000 to 1,500 miles. This refueling method was demonstrated to the Army Air Forces Board in January of 1944 but they rejected the system since they did not percieve a tactical need for air refueling at the time.